Cat Get Stressed For Veterinary Visits? Try This! Cats are stress driven animals, that is, they have a very strong fight or flight response. It is an evolutionary adaptation that they inherited from their wild ancestors that enables them to survive alone as solitary animals without the aid of a herd or pack to support them. Stress hormones drive the strong fight or flight response which can be particularly powerful in some cats. While most domestic house cats are cooperative and many even affectionate at the veterinary clinic, for some, between getting shoved into a carrier, driven over in the car, being in a waiting room full of other strange animals whose scents they pick up or they hear meowing or barking, then being pulled out of their carrier, temperature taken, examined, and given injections; the experience can be overwhelming and some respond with fear. This response can be as mild as trying to escape the restraining technician, to more fear aggressive behavior such as hissing, growling, scratching, and biting. There are occasional cats that we literally cannot even approach in the state they work themselves up into, attacking the door of the carrier as we try to unlatch it. These cats are not by nature mean. As frustrating as it can be for cat owners and veterinary health care professionals when working with fear aggressive cats, we really need to view them with compassion and understand that they are just scared and reacting to defend themselves. They are not means animals bent on hurting humans, they are just highly stressed and reacting physiologically. Many of these kitties are even docile, cuddly and playful at home. I should know, I have one; my couch and pillow buddy, Enrique who is a love at home but behaves more like a badger when taken to the clinic. In order to facilitate a more effective examination and get what is necessary done in the veterinary clinic without resorting to gassing them down in an induction chamber (aka., the “cat box”) or other forms of potentially sedation; and for the sake of minimizing the cat’s stress and providing a less scary and safer experience for the feline patient (and for veterinary staff wishing to avoid get their arms bitten and shredded), there is a very safe and effective anxiety reduction protocol that has proven very effective in feline medicine. Gabapentin is a medication that serves many purposes in medicine. It is used to treat nerve pain, cancer pain, as adjunctive therapy for seizure disorders, and is known to have an anti-anxiety effect that is especially profound in cats. The protocol is to dose a cat scheduled to a veterinary visit the evening before the visit with 100 mg gabapentin, then re-dose with the same dosage 90 minutes prior to the veterinary visit the next day. The improvement of the stress levels of cats using this protocol is often nothing short of astounding in many cases. The gabapentin does not knock them out or even outwardly sedate the cats, it simply takes the edge off to effectively calm them for a less stressful experience. I would recommend this protocol for any scared cats, even if they are still able to be handled. 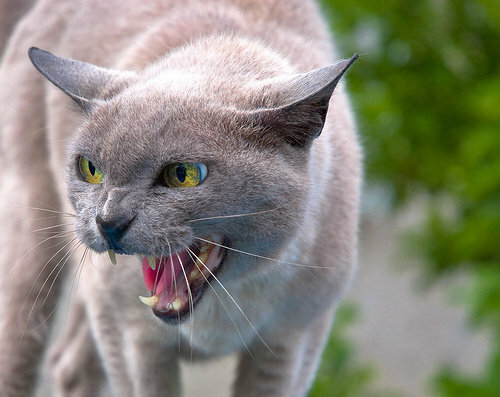 Some stressed cats will pant (which is never normal in cats), others will freeze in place un-moving, while others are what we call “talkers” that will hiss and growl but not really strike out with claws or biting. If your cat exhibits any of these signs at veterinarian visits, there is no point in letting them suffer with stress even if they can still be handled. Gabapentin is safe, inexpensive, and effective following the above protocol. Dr. Roger Welton is a practicing veterinarian and highly regarded media personality through a number of topics and platforms. In addition to being passionate about integrative veterinary medicine for which he is a nationally renowned expert, Dr. Welton was also an accomplished college lacrosse player and remains to this day very involved in the sport. He is president of Maybeck Animal Hospital , runs the successful veterinary/animal health blogs Web-DVM and Dr. Roger’s Holistic Veterinary Care, and fulfills his passion for lacrosse through his lacrosse and sport blog, The Creator’s Game.